Blade length 15 cm 5.90 "
Overall length 30 cm 11.81 "
Thickness 4,5 mm 0.17 "
On 17/18 September 2011 was held at the Polygon of Sassuolo the "Red Lily Pegasus Trophy 2011" -"Fallen Memorial in Afghanistan," an annual national event organized by Operation of Tyre UNUCIFlorence, which was attended by over 140 shooters between the military, by far the greater part, as well as civilians. Sunday 18 at the end of the exercise, which was made after the 'Honor the Fallen. 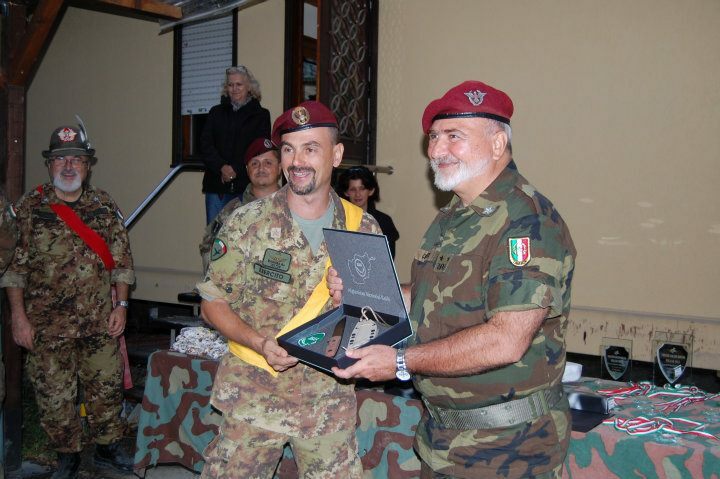 The General Div (r) Cirneco Calogero, president, CEO UNUCI Florence and the Tuscan Regional, awarded by lottery in front of the large number of these commemorative knife AMK to the Captain (r) Giancarlo Ragusa of Brig Par Lightning. In one picture also the General Manager of Br (r) of the Alpine Corps Franco Rossi, Vice President of UNUCI Florence, C.le magg. Alessandro Camarrone, Soul of the Organization of the Trophy.